I picked up this book to try and read “just a few” pages before I cleaned my house, but was immediately taken in by some clever and beautiful writing. 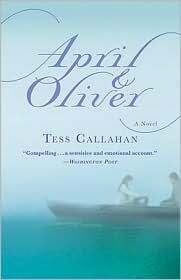 April and Oliver is the story of two friends who were close for many years, had a physical attraction to each other as well and who were even referred to as soul-mates. Their lives go different ways and they lose touch with each other. When April’s brother dies tragically and suddenly, Oliver cannot stay away and comes home to be with his long lost friend. You can literally feel the tension between them in the opening pages of the book and you just know there is something deeper going on and that folks is what sucked me in and took me away from my housework! I can’t say too much more because I am afraid I will give away the important bits that you should discover yourself~ there are many twists and turns along the way and one surprise I certainly did not see coming. One reviewer compared Ms. Callahan’s storytelling skills to that of Jane Austen and I can see where they would get that. It’s a complicated love story with characters who keep you interested and wanting more. Great book. A keeper for the book shelf! Vicki is a single woman living in Nova Scotia, Canada who loves to read, sing, cook for her friends and family and scrapbook. She loves to keep busy, hang out with her boyfriend and his cat and only sits still long enough to read and review books for "Simply Stacie."